Ever feel like the digital age has taken over your life and the lives of your loved ones? Listen in as Kathi interviews Arlene Pellicane to discuss Arlene’s new book, “Calm, Cool and Connected”. Learn five digital habits for a more balanced life and how to tame the modern tools to take back our lives. Forming new habits, we can learn to navigate the digital world and prioritize loved ones, as well. Leave a comment on our website to be entered to receive a free copy of Arlene’s new book. Allot a certain amount of time for social media. Do you use social media for personal reasons? 15 minutes a day may be plenty. Need to use social media to promote your business? Maybe 1 hour a day will do the trick. Determine how much time per day you’ll spend on social media and stick with it. Track your time for one week if you’re having a hard time getting off. Eliminate social media during mealtimes. Not even FaceTime can replace real human interaction. Dinner is not the time to scroll through your social media posts, even when your party is waiting for a table at a restaurant. In a Stanford University study, girls who spend much of their waking hours on social media are more likely to develop social problems. One antidote? Plenty of time interacting face-to-face with people. Don’t look at social media first thing in the morning or at bedtime. If you greet the day with notifications and FB, you feel behind before breakfast. Instead, spend first minutes in prayer and reading God’s Word which is a much better way to frame your day. Likewise, drift off to sleep by counting blessings instead of counting all the emails you have to respond to the next day. Participate in social media fasts. If you would be anxious about missing out on social media for one week, you are a good candidate for a fast. Researchers are finding chemical changes in certain pleasure areas of the brain when we get that “social media hit.” If it’s becoming addictive and disruptive to the rest of your life, a time of detox can be very healthy. You can also take one day a week off or have social media free weeknights. Use it to stay connected with a handful of friends. My parents use WhatsApp to send photos to family members overseas. When you use social media to stay in touch with just a few people, it can enhance relationships versus scrolling through news feeds to check in on the masses. 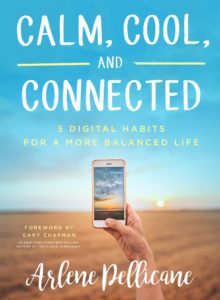 For more tips on managing technology so it doesn’t take over your personal life, read Calm, Cool, and Connected: 5 Digital Habits for a More Balanced Life. Arlene Pellicane is a speaker and author of five books including 31 Days to Becoming a Happy Wife, 31 Days to a Happy Husband and 31 Days to a Becoming a Happy Mom. She has provided expertise as a guest on the Today Show, Focus on the Family, Fox & Friends, Family Life Today, The 700 Club, The Better Show, The Hour of Power, Turning Point with Dr. David Jeremiah, Home Made Simple on TLC and numerous radio programs. Arlene earned her BA from Biola University and a MA from Regent University. Before becoming a speaker and author, she served as a features reporter for The 700 Club and associate director for Turning Point Television with David Jeremiah. I don’t use cell phones much and still have a landline. I hesitate to call people on cells because I feel that may be out and about in the middle of shopping and can’t talk and I feel rejected or that I wasted my time. My cell phone has an old-fashioned text method so I don’t text. Also so many people have their voice mail boxes full that you can’t even leave a message. What was supposed to be convenient has turned into more work for us all. Also there is the signal problem!!! Thanks Arlene and Kathi for helping us think through this kind of stuff. The Pivot is such a great idea! I often feel like I am ignoring my kids but I am afraid of forgetting to complete my task on my phone or computer. The pivot solves both problems; I can still acknowledge my kids and complete my current task! So simple but so brilliant. Awesome episode! I frequently find myself scrolling with no purpose. I need to be more intentional in all areas of my life and starting with less screen time will certainly help. Thanks!! I need to make a note to do things as quickly as possible on the computer. Sometimes I am really slow and spend 10-15 minutes crafting an email reply when a 2 minute response would suffice. I need to focus and to not overthink it!! I definitely need to ask myself before I go online “what am I here to do”. Excellent advice! Congratulations Rebecca! You are one of the winners of the giveaway! You will receive an email asking for your mailing address shortly. Thank you for participating! Have a blessed day! This episode is so relevant to my family right now. I like the pivot idea. I will be implementing that in my life and teaching it to my kids! I need to set a timer when I get on social media. If I were at an actual social event I’d have a plan for how long I’d stay and the same should be true for me when socializing virtually. I love this so much. I have been trying to do better about controlling my time with electronics/screens. The “pivot” is such good advice. I homeschool my children and acknowledging them each time can be difficult when I’m working because they are with me all the time. But I know being intentional about giving them my attention is so important. And using devices “purpose” is another great habit. Thank you so much for addressing this topic! Congratulations Melissa! You are one of the winners of the giveaway! You will receive an email asking for your mailing address shortly. Thank you for participating! Have a blessed day! The reminder to know why I am on the computer is so simple and good. I can get easily enticed by other stuff and forget why I’m there. I need to implement the hot potato idea as well! I get on the computer then realize I’ve wasted so much time. I also need to do the pivot as well! So many changes I need to make! Congratulations Tracy! You are one of the winners of the giveaway! You will receive an email asking for your mailing address shortly. Thank you for participating! Have a blessed day! Love this episode!!! I have gotten rid of Facebook app on my phone because it was just sucking my life. But something new that I want to implement is having my phone away from when the kids get home from school to when they go to bed. I don’t have a landline but want to use my cell as a landline and have it hung up for only calls at night. Thank you so much for the remind again how much technology has consumed our lives so much. I really like the hot potato idea. Think of why your getting on the tablet and then get on and off quickly. This is a strategy I need to implement.